PARKER, DANIEL McNEILL, physician and politician; b. 28 April 1822 in Windsor, N.S., son of Francis Parker and Mary Janet McNeill of Petite (Walton), N.S. ; m. first 9 June 1847, in Halifax, Eliza Ritchie Johnston (d. 1852), eldest daughter of James William Johnston*; m. secondly 26 Aug. 1854 Fanny Holmes Black, also in Halifax, and they had six children, two of whom died young; d. there 4 Nov. 1907. The son of a magistrate and Baptist deacon from Hants County, Daniel McNeill Parker spent six years in public school in Petite before studying at King’s College School and Horton Academy. He began his medical training as an apprentice to William Bruce Almon* in Halifax, where he learned to prepare and dispense medicines, dress wounds, extract teeth, and, eventually, prescribe for patients. In 1842 Parker enrolled at the University of Edinburgh, where he completed a thesis entitled “The management of parturition.” He graduated in 1845 with the gold medal in anatomy, although a dispute with the professor of botany almost denied him his degree. While at Edinburgh, Parker spent his summer vacations as a clinical clerk to the celebrated physician James Young Simpson. In 1845 Parker returned to Nova Scotia and quickly established a lucrative private practice in Halifax. Like many of his colleagues, he involved himself in a number of charitable ventures, attending periodically at the Poor’s Asylum and working with William Grigor* at his dispensary to provide care to the sick poor. On 5 Feb. 1848, at the Poor’s Asylum, Parker witnessed William Johnston Almon make the first use of chloroform in surgery in Nova Scotia. (Chloroform had first been employed by Simpson in Edinburgh three months earlier.) Soon afterwards Parker experimented in the use of sulphuric ether in collaboration with Halifax dentist Lawrence Edward Van Buskirk, who had travelled to Boston in order to familiarize himself with its application as an anaesthetic. Van Buskirk administered ether to Parker experimentally to allow him to experience its effects, and a day later Parker used it in an operation to amputate a leg. Parker also is reputed to have performed the first ovariotomy in Halifax, in collaboration with a Dr Keith of Edinburgh (probably George Keith, a colleague of Simpson’s). Despite important advances in surgery, the mid-19th-century medical profession in Halifax faced considerable public suspicion, the challenge of irregular practice, and outright quackery, and it struggled to establish its claims to authority and public confidence. These handicaps may explain the extensive involvement of doctors such as Parker, W. J. Almon, and Grigor in politics and charitable work and in the establishment of institutions which enshrined contemporary definitions of scientific medicine and social improvement. 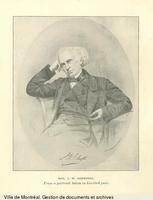 Over the years Parker was active with Grigor in the Halifax Mechanics’ Institute, giving the first of a number of annual lectures in 1845. In addition, he was a founder of the Halifax Institution for the Deaf and Dumb and the Halifax Young Men’s Christian Association (1853), a governor of Acadia College, and a member of the Halifax Horticultural Society. Parker was one of the commissioners who arranged to have a Nova Scotia exhibit at the Great Exhibition of 1851 in London, England, for which he received the Prince Albert Medal, and with Alexander Forrester* he was responsible for establishing the Nova Scotia Industrial Exhibition in 1854. In 1867 Parker was appointed to the Legislative Council. Although not a particularly forceful member, he occasionally was roused to action. During the session of 1876, for example, he spoke for three hours one day in opposition to the bill to establish a provincial university. Parker was also involved in a number of institutions dedicated to the advancement of the medical profession and health care in general. He participated in the establishment of the Medical Society of Nova Scotia (1854), the Canadian Medical Association (1867), and the Halifax branch of the British Medical Association (1889), and he was a member of the provincial medical board from 1872 to 1888. President of the Medical Society of Nova Scotia in 1857, he was elected president of the CMA in 1870, following in the footsteps of his lifelong friend Charles Tupper*. Parker was on the staff of the Provincial and City Hospital (later the Victoria General Hospital) and the Victoria Infirmary, and he was involved in the creation of the medical faculty at Dalhousie University in 1868. Although Parker retired from medical practice in 1895, he maintained his seat in the Legislative Council until 1901. He died six years later. Daniel McNeill Parker published a memoir, “On the completion of fifty years active professional work,” in the Maritime Medical News (Halifax), 7 (1895): 205–18. Dalhousie Univ. Arch. (Halifax), MS1-12 (7.1a). PANS, Biog., McNeill, Daniel [records of the McNeill and Daniel families et al.] fm. ); MG 20, 181, minutes, 9 Oct. 1854, 8 June 1873; MG 100, 139, no.24; RG 5, P, 46, no.49; RG 32, 157, 9 June 1847. Acadian Recorder, 2 Aug. 1895. Maritime Baptist (Saint John, N.B. ), 22 Feb. 1928. C. D. Howell, “Elite doctors and the development of scientific medicine: the Halifax medical establishment and 19th century medical professionalism,” Health, disease and medicine; essays in Canadian history, ed. C. [G.] Roland ([Toronto], 1984), 105–22; “Reform and the monopolistic impulse: the professionalization of medicine in the Maritimes,” Acadiensis (Fredericton), 11 (1981–82), no.1: 3–22. [K. A. MacKenzie], “Honorable Daniel McNeill Parker, m.d. Edinburgh, d.c.l. Acadia, 1822–1907: a dean of Canadian medicine,” Nova Scotia Medical Bull. (Halifax), 29 (1950): 149–54. Maritime Medical News, 19 (1907): 438–40. Nova Scotian Institute of Science, Proc. and Trans. (Halifax), 12 (1907–8): xxiv. Colin D. Howell, “PARKER, DANIEL McNEILL,” in Dictionary of Canadian Biography, vol. 13, University of Toronto/Université Laval, 2003–, accessed April 26, 2019, http://www.biographi.ca/en/bio/parker_daniel_mcneill_13E.html.